Job Responsibilities  Implementing and reviewing of the EHS management system.  Creating EHS awareness throughout the company.  Ensure adequate resources are provided to meet the companies’ health and safety objectives.  Conduct accident and incident investigations and make recommendations for corrective actions.  Facilitate providing of necessary knowledge and skills on accident and fire prevention to staff. 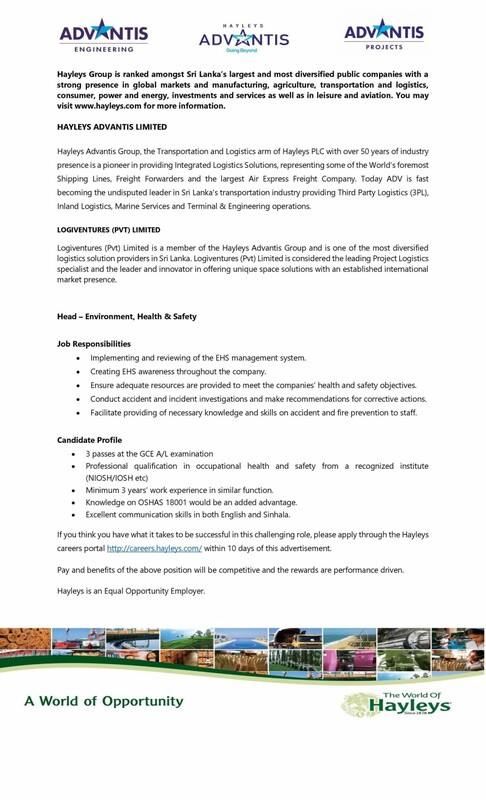 Candidate Profile  3 passes at the GCE A/L examination  Professional qualification in occupational health and safety from a recognized institute (NIOSH/IOSH etc)  Minimum 3 years’ work experience in similar function.  Knowledge on OSHAS 18001 would be an added advantage.  Excellent communication skills in both English and Sinhala.